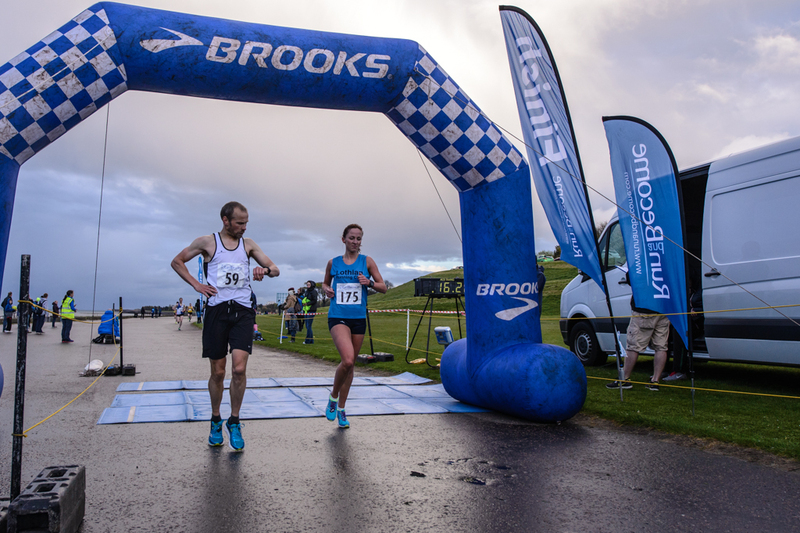 Callum Hawkins entered his first Scottish 5K with the full intention of ‘blasting it’ on the seaside course at Silverknowes – and seeing where that took him. 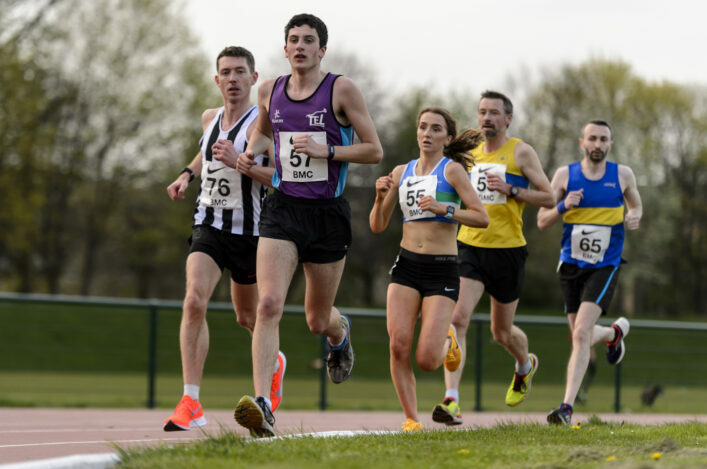 What transpired was a course record run of 14.17 in windy conditions and an impressive margin of victory for the Kilbarchan AAC athlete of 24 seconds on silver medallist Craig Ruddy of Inverclyde (14.41) with Shettleston’s Tewolde Mengisteab in third in 14.44. 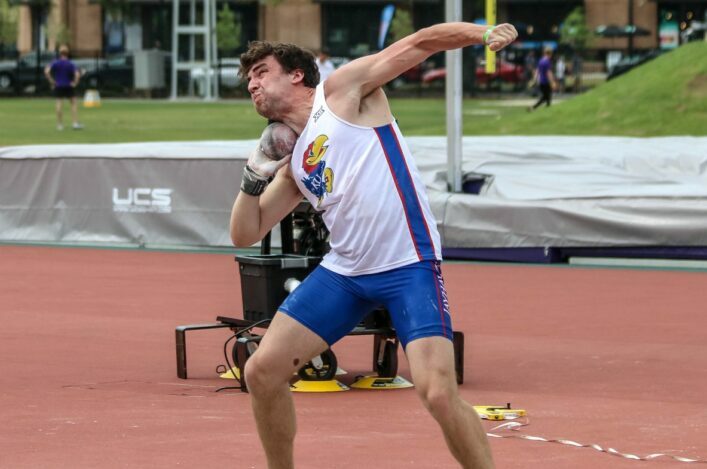 Now Callum, who reckoned that course record would have been even lower but for a slow – by his standards – last kilometre, aims to break 14 minutes on the track with a forthcoming meeting in Belgium his next opportunity. 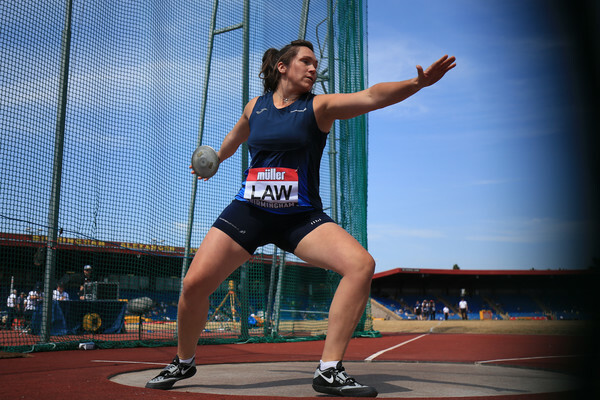 Lothian Running Club’s Sarah Inglis made the most of her break from studies at Trinity Western University in Canada to win the Women’s gold in 16.25 as she was joined on the podium by Josephine Moultrie of VP-Glasgow and Stephie Pennycook of Fife AC. Pennycook won the Women’s U20 medal as well at 16.57 with GB cross country international, Inverclyde AC’s Jonny Glen, taking the Men’s U20 gold in 14.52 while in the Masters categories there was a fifth successive gold victory for Kerry Liam-Wilson of Ronhill Cambuslang with 15.29. Garscube’s Lesley Chisholm won the Women’s Masters gold in 17.42. 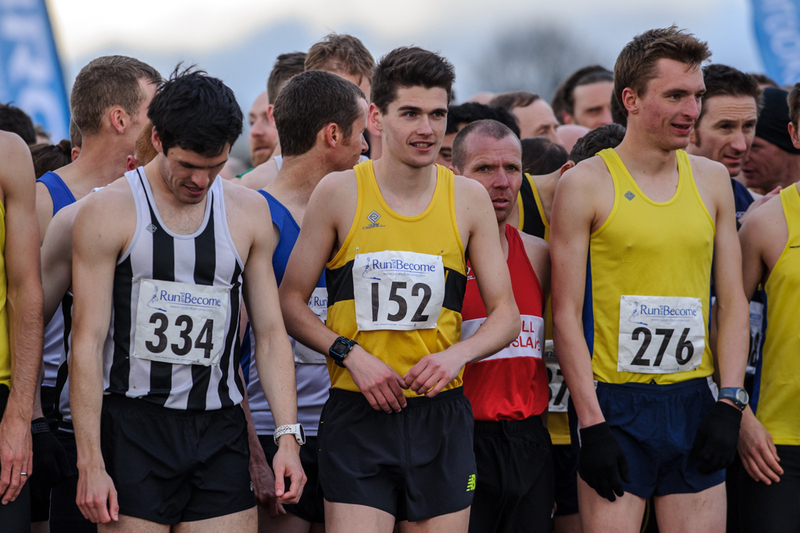 Callum’s 14.17 improved significantly on the previous course record at Silverknowes of 14.35 – set by three men in three different years, Chris MacKay, Ross Houston and Andrew Butchart. 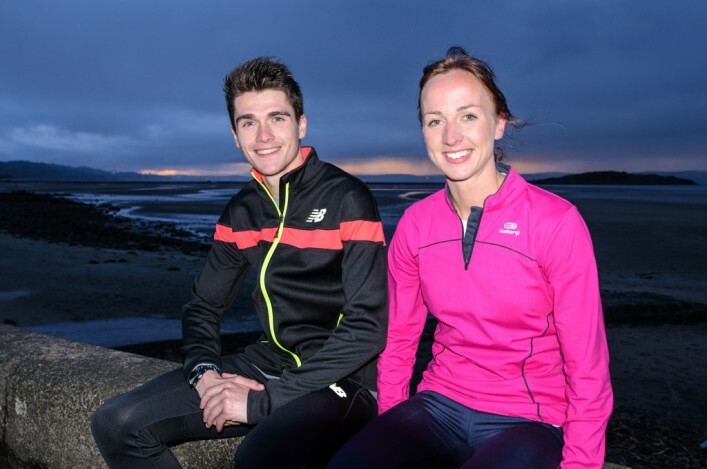 ‘The idea was to go out and blast and see where that took me – I did exactly that,’ smiled Callum, who raced the 10,000m for Scotland at Glasgow 2014 at Hampden last summer. 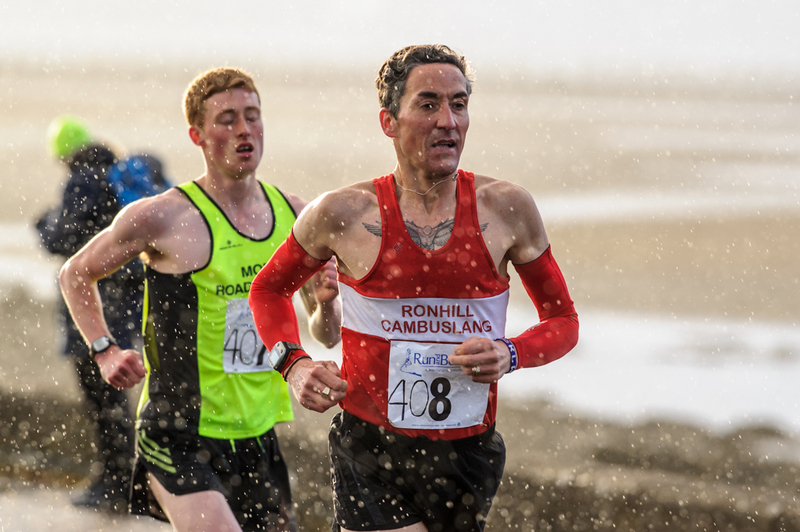 ‘I enjoyed and I am pleased to win the Scottish 5k title but that last kilometre, into the wind on the way back, was pretty tough. I did that in about three minutes and was flapping around like a swimmer apparently! ‘The first three k I have on the Garmin as around 8.22 so it had been going very well up until the point where you start to turned back into the wind. I think everyone would have found that tough. ‘This is the first time I have run here and it is a good course – it would be absolutely brilliant if you had a calm evening at some stage. But there have been some good runs and I’m delighted with a course record. Hawkins earned an A standard five shares in the scottishathletics Road Race Grand Prix with Ruddy, who won the Scottish 10-Mile title, and Shettleston’s Mengisteab taking B standards. Inglis just missed out, with 16.24 required the B standard for women. ‘I am pleased to win and it was a good run on the night,’ said Sarah. 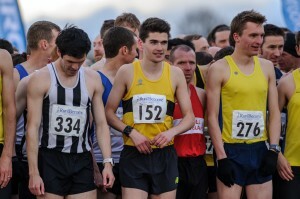 ‘I’ve managed to squeeze in the Road Relays at Livingston and this 5k Champs during a spell at home – and it is squeezed in because I am off to America on Friday for altitude training in Boulder, Colorado. Once again the Run and Become Self Transcendence race helped raise 5k standards in Scotland. With 327 finishers, some 34 were under 16 minutes and 137 under 18 minutes and, at the top end of the men’s race more people were running faster than in 2014. Central AC won the Men’s team crown with three athletes in the top 10 – Alex Hendry (4th), Alistair Hay (5th) and Cameron Milne (8th). Scott McDonald (9th) didn’t even make the scoring team, demonstrating the depth at the club. Inverclyde AC took the silvers and Ronhill Cambuslang the bronzes. Fife AC won the team golds – another medal for Pennycook – with Lothian Running Club taking silver and Ronhill Cambuslang the bronzes.